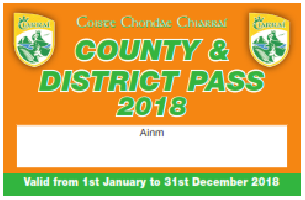 The very popular Kerry GAA Pass which entitles the bearer to entry to all games under the auspices of the Kerry County Committee and Divisional Committees is now available to purchase at Kerry County Board Offices in Austin Stack Park and in the Kerry GAA Store in the Outlet Centre Killarney. Cost is €125 and this is a very popular and ideal Christmas Gift. Note: The Pass is not valid for Provincial and National games.